For this week, our tenth pick is the first two games of the ALCS between the Houston Astros and Boston Red Sox. Please enjoy Matt's diatribe on how the Astros are better at using analytics than everyone else. Joe took a slightly less, uh, analytical approach to his picks. Parello's Pick: I'm flying with the Rockets until further notice. This is legitimately one of the best teams in the state, and it isn't just about the explosive passing game anymore. Feld's Pick: The Wildcats may not be ranked in our poll, but make no mistake they are not taken lightly. Luke McMenamin has played as well as any quarterback and Milton's defense lately has been rock-solid. Still, this Needham team is tested and I expect Charlie Ogletree to step up in the clutch. Parello's Pick: Another team that I thought might be one-dimensional at the beginning of the season, but North Andover has really developed into a well-rounded team. Dracut is no pushover, but I have to think the Scarlett Knights keep rolling. Feld's Pick: This a tough road matchup for the Scarlet Knights, but they have shown time and time again this season that they are the team to beat in Div. 2 North. 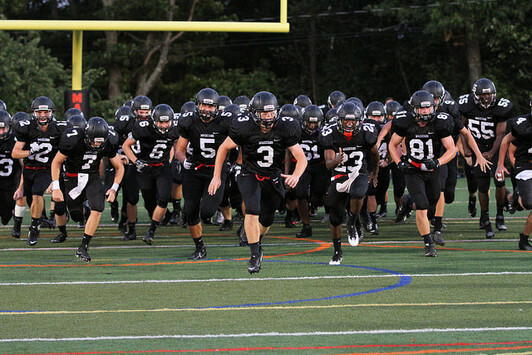 Jake McElroy's dual-threat capability is the difference here as North Andover improves to 6-0. Parello's Pick: The Prep is riding high, while BC High is in utter desperation mode... This should be fun, and methinks it will come down to the wire. Feld's Pick: Sitting at 2-3, BC High is in desperate need of a win in order to solidify its postseason aspirations. They come out and turn in their finest performance thus far as they are in the midst of a brutal slate, but John's Prep has been as impressive as any team in the state so far this season and they're offense proves just too much to handle. Parello's Pick: You think I'm betting against the Hornets when they have a chance to lock up the Kelley-Rex? Not a chance. Feld's Pick: Attleboro will be fired up for this one. Its stout line play should keep Mansfield's ground game in check in the early going, helping to turn this one into a rock-fight. Still, the Hornets wear down Attleboro as the game goes on and come through with a handful of backbreaking runs late to claim the Hockomock Kelley-Rex crown. Parello's Pick: Hingham ran into a buzz saw against Duxbury last week, but this is still a team that can do some real damage. Plymouth North is tough, but the Harbormen have some frustrations to let out. Feld's Pick: Plymouth North has largely flied under the radar as they have proven they can give any team in the Patriot League fits. In a low scoring affair, Spencer Cassell breaks out in the passing game and becomes the difference maker as Hingham escapes. Parello's Pick: Springfield Central has almost been too dominant out west, that they've largely flown under the radar (even here at SuiteSports). But make no mistake about it, SC is a legit state title contender in D3, and probably the best team west of 495. Westfield has some weapons, but not enough to keep up. Feld's Pick: If you love Big-12 football then you are going to love this matchup. These two high-octane offenses are set to put up big numbers when they go at one another. I love what Dakota Moynihan and co. have done so far in Westfield, but Central's experience in big games pays dividends. Parello's Pick: This game has sneaky upset potential, but Central Catholic's talent carries it to a close win. Feld's Pick: The Rangers have been waiting for this opportunity for sometime now. Not only do they have the chance to defeat Central Catholic, but they have the chance to do it on their home field with an MVC Large title in the balance. Methuen has played in nail-biting games all season long, and they squeak one out again in a thriller. Parello's Pick: Gloucester has been one of the state's more pleasant surprises, but the Magicians have been here before, and know how to win big games. Feld's Pick: Plenty of anticipation heading into this one as a pair of 5-0 teams jockey for first place in Div. 4 North. This is sure to go down to the final minutes of the fourth quarter, but I like the Fisherman, and their ground attack, to capture a huge home victory. Parello's Pick: Ain't no shootout like a small school shootout, and I'll take St. John's Paul to come out on top in this one. Feld's Pick: This is as a good lower-division matchup as you're going to get, with Pope John living up to the preseason hype and St. John Paul sitting pretty at 5-0. In a potential preview of the Div. 8 State-Semis, Pope John squeaks by late in a high-scoring contest. Feld's Pick: This series has everything you want come the postseason. Between young stars, veteran aces, and a defending World Series champion you are undoubtedly getting the two best teams in baseball in this ALCS. The Astros have been the best road team in baseball this year, going a staggering 58-24 in 82 road contests (including their ALDS clinching win over the Cleveland Indians). The difference here, quite frankly, is that the Astros analytics department is just that much more advanced than everyone else's. I know the old-time baseball writers don't like it. Imagine the look on Nick Cafardo's face if he were to find out how the Astros do business! But it's true. For the past two years, the Astros have dominated the sport using innovation and technology to breakdown every facet of the game in an effort to gain an advantage. They've drafted nearly perfectly, complemented their young core with seasoned veterans such as Josh Reddick and Brian McCann, and went all-in on two cemented aces in Justin Verlander and Gerrit Cole. There is a reason that they handled every member of the vaunted Cleveland Indians rotation when no one else could - and its not because they're so much better than everyone else. It's because they've identified habits among the Indians pitchers and that no one else has and used them to their advantage. The Astros batting average was higher than the Indians OPS (!). You think that the Indians just forgot how to hit? Don't get me wrong. the Red Sox have also heavily relied upon their analytics department (Newsflash, folks, Alex Cora choosing Brock Holt in game 3 and electing to ignore matchup numbers isn't ignoring analytics, its using them. Its been proven matchup numbers mean nothing as it pertains to future success). The Astros, Red Sox, Indians, Dodgers, and Brewers have become the pioneers of the big data movement in the sport, and you're in old, cranky baseball man denial if you think it just happens to be a coincidence that they also happen to be five of the best teams in baseball this season. Houston is just better at it than everyone else, just ask Trevor Bauer. Long story short, the Astros identified something in Chris Sale last year come the postseason, and it worked. They're at their best in the postseason because they have more information than anyone else. I expect Jose Altuve, George Springer, Carlos Correa, Verlander, and Cole to combine their incredible talents with the excess data they have to take care of Sale, David Price and the Red Sox in games one and two.